The Salute To Pearl Harbor tour immerses you in the sights, sounds and personal stories of the world-changing events of Pearl Harbor, December 1941. 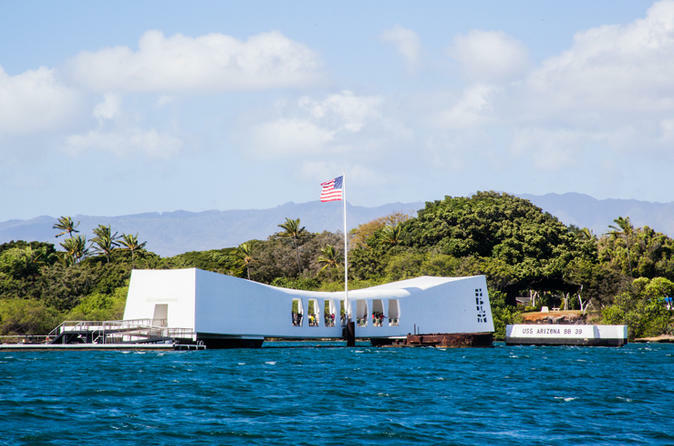 This is the way to see Pearl Harbor; with a knowledgeable guide who provides helpful insight and information, fascinating historical and cultural background-with the ease of transportation and a tour package that includes everything you need to visit the WWII Valor of the Pacific National Monument and the USS Arizona Memorial. Upon picking you up, your guide begins to share local stories and interesting bits of history-setting the scene of that fateful day in December 1941-as you head towards Honolulu’s Pearl Harbor. Soon, you arrive full of anticipation at one of Oahu’s most famous destinations. You feel the site’s power as you enter the new World War II Valor in the Pacific National Monument. Here you revisit the past through never- before-seen artifacts, replicas and media displays that explain the events and details of the day leading up to and following the Pearl Harbor attack. Looking across the harbor’s blue waters at Ford Island, the center of the attack, you imagine the residents waking up on a Sunday morning to chaos and madness. A historical film, a journey in time across the harbor, and perhaps a chance to meet a survivor of the attack complete your morning at the Memorial.